In a near-future America, all crime is legalised for one night each year. This sequel depicts the struggles of a group of strangers on annual purge night, though the film lacks the suspense needed for a horror film that’s truly terrifying. Set in 2023, The Purge: Anarchy retains the same premise from the first film, whereby the legalisation of crime for one night a year is used to keep crime rates down. The film provides little background information, telling audiences only that the annual Purge was sanctioned by the New Founding Fathers. This mystery adds a much more frightening tone, whilst the lack of detail protects the somewhat thin, unrealistic premise; the notion of the purge is often, quite fairly, dismissed as ludicrous, so much so that attempts to justify or explain it are unlikely to be viewed as satisfactory. As the film begins, we are introduced to waitress Eva (Carmen Ejogo), who is struggling to pay for her father’s medication whilst providing for her plucky teenage daughter, Cali (Zoë Soul). As purge night gets underway, Eva’s father secretly sells himself to a rich family as a sacrifice; news which saddens the family for a grand total of two minutes before being swiftly forgotten. Both mother and daughter find themselves forced to the streets when their building is raided by a SWAT team working for the machine gun toting Big Daddy (Jack Conley). Elsewhere, troubled couple Liz (Kiele Sanchez) and Shane (Zach Gilford), in an act of extreme stupidity, decide to do their grocery shopping 20 minutes before the legalisation of murder. On the most dangerous night of the year, the couple also find themselves stranded out in the open after their brakes are cut by some creepy masked skateboarders. The two groups are brought together when the morally ambiguous Leo (Frank Grillo) helps to defend them until they find safety. After the characters meet Leo, most of the suspense disappears from the film. Leo appears to be some sort of superhero, eradicating almost all potential danger, e.g. Leo easily defeats several armed hunters equipped with night-vision goggles in complete darkness. With his bare hands. Although by being outside the characters are more vulnerable to opportunistic purgers, they are also too well protected, and, for the most part, too free from peril. This leads to a film which is overly tame and subsequently not frightening enough to fit into the horror genre. While this in itself is not a criticism, The Purge: Anarchy is certainly marketed as a horror, and thus the film is likely to disappoint cinemagoers expecting to be scared. 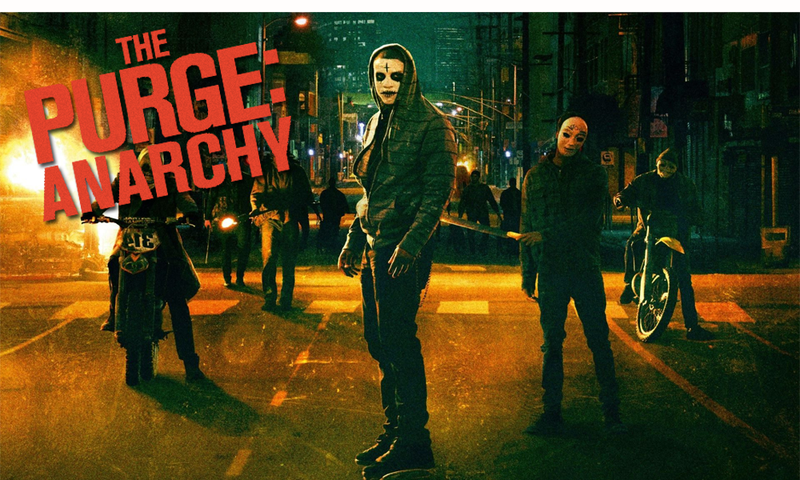 The Purge: Anarchy has a very different tone to its predecessor. The traditional suburban-family-in-a-home-invasion plot employed in the first film led to the criticism that an original premise was wasted on an otherwise familiar and conventional horror film. Admirably, the filmmakers listened, and aimed to give audiences what they wanted with a less conventional, more anarchic sequel. The term ‘sequel’ is used loosely, as there are little or no references to the original The Purge within the film. With a whole new cast and a vastly different setting, The Purge: Anarchy seems like less of a sequel and more like the filmmakers had another go at making the premise work. Sadly, it seems as though they still didn’t get it right. The film opened up many possibilities by choosing to focus on a group of strangers fighting to survive outdoors. This should have led to more grisly deaths, more purging maniacs, and, ultimately, a sequel far more terrifying than the original. However, yet again the filmmakers have not made full use of the horrific and unique premise. In contrast to the genuinely sinister, sadistic villains of The Purge, this sequel omits creepy antagonists in favour of faceless beings who like to shoot a lot. The whole film was simply a battle of bullets, consequently appearing more akin to an action film than the horror film it claimed to be. Similarly, although offering us a better view of what purge night is really like, The Purge: Anarchy simply does not seem anarchic enough. The film focuses only on the main protagonists, and, even though they were out in the open, audiences saw very little of the ‘anarchy’ taking place around them; another missed opportunity which could have added both realism and horror to the narrative. Unlikely to satisfy either action or horror fans, The Purge: Anarchy makes a desperate attempt to gain audience approval by turning into The Hunger Games for ten minutes in the middle of the film. Much like The Hunger Games, the film depicts a dystopian society in which the slaughtering of citizens is permitted annually. The dystopian elements of the premise are emphasised much more in The Purge: Anarchy compared to its precursor. A political agenda behind the purge, i.e. the poor and the homeless are eradicated, is discussed within the film, and the addition of anti-purge activists adds some realism to the movie; the original film seemed to portray everyone blindly accepting this horrible, unfair new law. Despite how obviously terrible the idea of the purge is, the film does become a little too preachy, and the character of Cali seems to only have dialogue in order to directly tell the audience just how bad and wrong it is. The film’s script is fairly poor, and the characters only ever talk about their current situations and their feelings on the purge. Of course, it would be unrealistic to have the characters telling each other personal stories and having interesting conversations whilst their lives are at risk, yet the dialogue was often dull and extremely repetitious; within the first five minutes the phrase ‘stay safe’ is uttered an unforgivable amount of times. The actors in the film are largely lesser-known – a departure from the first film which features big names such as Ethan Hawke and Lena Headey – and they put in decent performances in spite of the weak script. While the acting is not terrible, the characters are the typical mix of dull, annoying and stupid, making it difficult to care about any of them. Much of the plot revolved around whether or not Leo would purge his son’s killer, but the film made it very difficult for audiences to care either way. The fast paced plot and the setting of the movie leave little room for character development, and thus, as with many modern day horror films, bonds with the characters are not formed. Although not conforming as a horror film – mainly by not being scary – the film borrows many cliché’s from the genre, notably exemplified by illogical character decisions and the three broken down vehicles encountered within the first twenty minutes. SUMMARY: More like a second attempt than a sequel, The Purge: Anarchy fails to fully utilise its premise and ultimately flops as a horror film. But don’t worry, there’ll probably be another one. Third time lucky, maybe. ▪ The purge is definitely, definitely a bad idea. Got that? It’s bad. ▪ Purge night is absolutely the best time to stay late after work and ask for a pay rise, delaying the safety of both you and your boss. ▪ People can go a whole year without committing a crime, yet they can’t wait an extra 20 minutes until the purge actually starts before cutting someone’s brakes.